Gluten-Free Girl and the Chef: A Vegan Feast (mostly. close). A Vegan Feast (mostly. close). millet fritters, originally uploaded by shaunaforce. Friday afternoons leave me happier than almost any time of the week. A solid five days of work, the feeling of having done something good in the world, dozens of connected conversations and graded papers and early mornings and heady anticipations—all of it behind me. And the freedom of the weekend: a wide-open space. Sometimes, nothing feels better than Friday afternoon at four. This Friday at four, I was at home, chopping up tomatoes and consulting recipes. Friends were due at 7 pm, and I had ambitious plans. For days, I had been fiddling with the menu, trying to find the right fit. After all, this needed to be a vegan feast. Daniel constantly amazes me. He speaks at least five languages and has every fact about 20th-century history at his fingertips. He tends the most profuse, diverse garden I’ve ever seen, with plants from Chile, the Himalayas, South Africa, and China. And he can recite the Latin names of every one of them. He lived in Japan for fourteen months, has visited every continent, and possesses an avid passion for traveling to the rest of them. Seemingly, he knows how to do everything. (But apparently, he’s no good at dancing. Whew. I wouldn’t know, since he won’t let me see it. But I’ve heard reports.) But when he laughs, I mean really really laughs, he looks just like a little boy. And he has been a vegan for 30 years. How do I feed him? And not just him, but also our dear friends Lisa and Mane. Lisa feels eternally young. When we see each other, spontaneously, we huddle together and talk in conspiratorial tones about the last two hours of our lives. She nudges me in the arm and laughs hard, a little whinnying at the top of it, joy coming out of her. She and Daniel have led trips to Spanish-speaking countries for years. I’ve heard so many stories about the beauties of Cuba that I am perpetually jealous. Lisa’s wonderful husband, Mane, comes originally from Spain. Jocular and open, he looks at you hard as he listens. He too has a beautiful giggle—his shoulders shake and he snickers, from deep in the belly. And on top of all this, he is the only known gardener in Seattle to coax a pomegranate tree to fruit. No one else. What a talented group there would be in my living room. Mostly, though, they’re just my friends. Daniel has been feeding me for years. 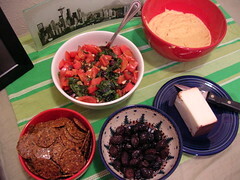 Exquisite, intricate-tasting, vegan food, on the balcony of his house, overlooking Eden in Seward Park. I can always count on eyes-closed appreciation moments at Daniel’s house. We could have eaten there again, but his dear partner, Jeff, had just left for Puerto Rico. And Lisa just had her kitchen remodeled, so she was in no mood to cook. I wanted to feed everyone, and I wanted it to be good. Lisa and Mane arrived first, laughing immediately. And then Daniel, who was hidden behind a huge box of flowers. 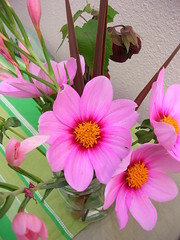 Dear one that he is, he had brought me bouquets of blooms from his garden. And these strange blue pods from China, like Muppet fava beans. 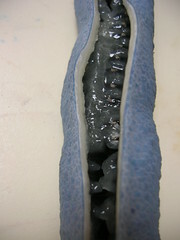 When you slither them open, they reveal shiny black seeds encased in clear, bluish pulp. Lisa and I shrieked, because it looked a spine, or a fat slug. But we stood in the kitchen, all of us, lowering our mouths to the sudden openings, slurping up the seeds with varying gusto. Once we sucked them clean of the sweet, mild pulp, we pursed the seeds between our lips and spit them into the trash. Then laughed. --a gorgeous artisan goat cheese from Carr Valley cheese in Wisconsin. Thank goodness for Metropolitan Market, which is featuring American artisan cheeses all this month. This Cocoa Cardona? Aaaah. A semi-soft goat cheese, with a cocoa powder rind. Not sweet at all, just smooth and dark. We all oohed and ate this one. You may be wondering—did Daniel eat them? He did. After a quarter century of being a vegan, he seems to have bent just a bit the past few years. Occasionally, he’ll eat goat cheese. Somehow, that feels more equitable to him than cow’s milk. I’m glad he’s flexible on that. Those cheeses were a joy. I wouldn’t want to have missed them. I have a large apartment, but of course we huddled in the kitchen, at first. And not just the kitchen, but the tiny nook under the skylights, where the food beckoned. But soon I had to turn the oven up to 425°, and that drove everyone to the living room. This was the big surprise of the evening. When I had dinner with Matt at Le Pichet a few weeks ago, he mentioned that he was thinking of some roast cauliflower for his sister’s dinner. Cauliflower roasted with cocoa powder. What? I had never heard of this, although my mind turned toward it. He said that he had learned at CIA (the Culinary Institute of America, for those who don’t know), that it was standard stuff there. Hesitant, I hadn’t made it yet. Not because I didn’t trust him, but because I haven’t liked cauliflower my entire life. Too rigid. Too chalky. Too....bleh. But Daniel had made some sauteed cauliflower once that tasted surprisingly good. And he has been urging me to conquer my fears ever since. As we laughed and talked, the guests in the living room, me in my familiar place before the stove, I tossed the cauliflower florets in Spanish olive oil, sea salt, and pepper. At the last moment, I decided to toss on some of this smoky Spanish paprika, dark red with a kick. And then, with a fine-mesh sieve, I sifted on some Ghiradelli’s unsweetened cocoa powder. Why this combination? A little chocolate and chile, mole sauce taste. I had no idea how it would work. Twenty minutes later, Daniel was exclaiming, Mane was groaning, Lisa was shaking her head in excitement, and I was just grinning. Oh god, this was good. Earthy, rich roasted, layers of taste—this roasted cauliflower was unforgettable. I’m going to make it again and again. Maybe next summer I’ll conquer my fear of beets. 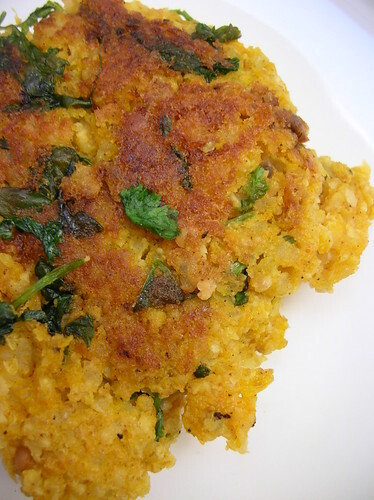 And finally, another new recipe I was eager to try: millet and butternut squash fritters. Another splendid recipe from The Splendid Grain. 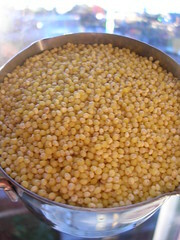 Millet, which was originally grown in Asia and whose correct name is proso, is most commonly sold in this country as bird seed. (Or at least some forms of it are.) Shame, that, because it has more iron than any other grain, makes a complete protein, and cooks up beautifully. And as with all these “unusual” grains, it once grew abundantly throughout the world, including in the Roman empire and northern China, where is was more popular than rice. Farmers in the midwest grow it in abundance. But having grown up in Southern California, in 70s and 80s, I had never heard of it. I’d certainly never eaten it. And even though I have been experimenting with every gluten-free grain I could try, I still hadn’t cooked any recipes with millet. Easy to make, the fritters look as though they’re going to be all wrong at one point. After I toasted the grain, it felt strange to put them in water, with cubes of butternut squash, raw ginger, and toasted mustard seed. I worried, about 5 pm, that these were going to be awful. But with the right mix of water (3 cups of water to 1 cup of millet), the millet absorbs all the liquid and becomes as soft as polenta. When it had cooled, I threw in handfuls of cilantro, then fried them up in olive oil. Oh baby. These were divine. There was more. An apple-ginger crumble. But at that point, it felt like gilding the lily. Everything else had already tasted so good. Such wonderful friends. Such a lovely Friday evening. Put the millet in a saucepan or wok over high heat. Toast, stirring constantly, for about four minutes, or until the first seed pops. Wash, drain, and set aside. Toast the msutard seeds and curry powder for one minute, or until aromatic. Put the millet and spices, water, squash, ginger, and sea salt in a medium saucepan. Bring to a boil over high heat. Lower the heat and simmer, covered, for 25 minutes, or until the millet has absorbed all the water. Remove from teh heat and let cool. Add the cilantro to the millet mixture. Wet your hands and blend the millet mixture to a fairly uniform consistency. Form into twelve cakes. Grill for about three minutes on each side, or until golden. Serve hot. What a feast, Shauna! Everything sounds wonderful. I'm glad you discovered roasted cauliflower. I am a huge fan and managed to convert even my vegetable-hating brother with them. I'll have to try them with cocoa powder. So HOW do you do this cauliflower? You begin it on the stove and then you put it in the oven??? And for how long? Shauna I need more information because I want to try it NOW!!!!! I just have to! I am also frightened of cauliflower(unless sweet pickled) and beets. I have been considering beets lately. I can't wait to see you conquer them! Yum, I love roasted cauliflower! I used to do it with just garlic and rosemary, but I think cocoa and smoked paprika are going to have to make a debut. If you're looking for more ways to experience this underrated vegetable, mashed cauliflower is also surprisingly good, especially with a little gruyere and a lot of pepper stirred in. I get so inspired every time I'm over here Shauna - everything you make sets off little voices in my head that exclaim 'that looks so good!'. These millet-squash cakes are no exception. Thanks for being such an inspiration. I love being converted to new foods, and letting go of my narrow mind. Yes, I'm converted to roast cauliflower. You have to try the cocoa powder. It's gorgeous. You MUST try it. So easy. Just cut the florets off the stalk of the cauliflower. Throw them in a bowl with lots of good olive oil, sea salt, and pepper. Toss. Then, sprinkle smoked paprika (Spanish; I'll put up the brand name when I'm at home), then sift cocoa powder. Roast in 425 degree oven until the cauliflower is soft and juicy. That's it! Daniel knows the Latin name. I'll ask him and insert it later. But they are bizarre and wonderful. Beets? I'll see. Thank you, my dear. It makes me joyful to think I'm inspiring you! Do try the paprika/roasted cauliflower. So good. And it would be a good hot dish against the Scottish nights. I recently fell in love with roasted cauliflower. I can't wait to try this new version with cocoa powder and smoked paprika or maybe ground chipotle powder. You simply must give fresh beets a try. I often roast them whole in their skins in a 450*F (or on the grill)for about an hour or until tender. Sometimes I'll wrap them in foil, sometimes not. Then, peel the skins and eat. They don't normally make it to the table as I eat them as quickly as I can peel them. Beets are delicious with chevre. I finally tried the butternut squash souffle and it was out of this world! I'm also a huge fan of roasted cauliflower, but the addition of cocoa sounds like a revelation! I've usually stuck to the basics, garlic, pepper flakes or crunched ancho chili powder. I will also chime in with Melissa's mention of mashed cauliflower - the texture is pure comfort (I usually use a food mill) and it can carry a good deal of seasoning, so experimenting is always suggested! I've not tried her idea of gruyère though ... but that seems like a lovely finish, possibly with some breadcrumbs as a bit of a twist on a gratin. Drat it, now I'm babbling, but you've got my mind going! I've been receiving so many comments and emails today, urging me to try beets, that I'm determined to swallow my bad memories of canned, pickled beets and start anew. I'll let you know! And I'm sure that ground chipotle powder would be fabulous in this too. Okay, other than the fact that I have to try gluten-free breadcrumbs, I think I'm just going to have to try your and Melissa's recipe soon! Wow, Shauna. I'm gone for a few days and you just keep cranking out the great dishes. All the more reason for you to come visit Seattle soon. And thanks. Looks like I'm a bit slow on the uptake, but I just had to add my praise for your luscious-sounding cauliflower with cocoa! You'd told me about the concept before, but I was as skeptical as you were. Now? Yessir! 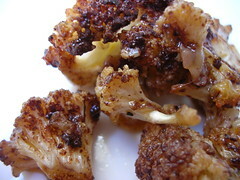 And as for roasted cauliflower in general, have you ever tried cutting it into slices, rather than florets? I aim for 1/4-inch slices, cutting from the top of the head to the stem. You wind up with a few intact slices and lots of cauliflower bits, but cutting it that way means that more of the cauliflower's surface area can rest on the baking sheet, making it caramelize beautifully. Give it a whirl, m'dear, and as always, thank you for sharing your explorations and enthusiasm! I can't wait to try the cauliflower! And I have the beet recipe that will change your life. It's from the book, "Mangoes and Curry Leaves: Culinary Travels Through the Great Subcontinent", by Jeffrey Alford and Naomi Duguid (they also wrote, "Hot Sour Salty Sweet). I think there are issues about posting copyrighted recipes online, so I will e-mail it. My husband HATES beets, but he loves this recipe. The gist: beets, coconut milk, chiles, curry leaves, shallots, vinegar. This is a pretty late comment...well, a really late comment, but where's the recipe for the apple-ginger crumble? I was all excited!